Very beautiful and original turn of the little things related to certain plain or colored square pieces, interconnected. In this way tally, eg, Baby blanket, plaid, prihvatki, mats, blouse, coat, cape, as well as many other products. 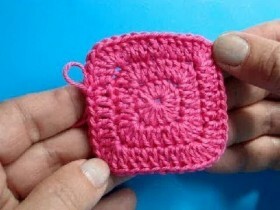 Make such products is not quite difficult, for it is only necessary to be able to crochet a square. 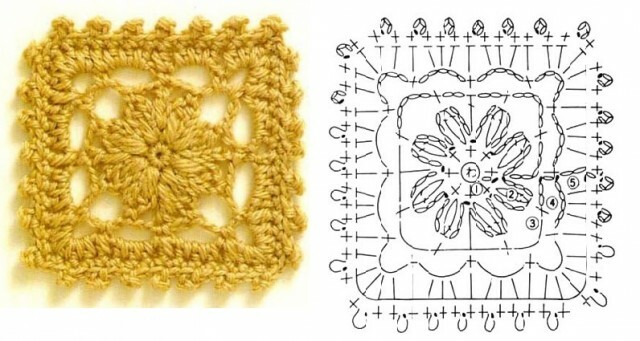 And it can be done in the following ways: from the corner or the middle, and square can be formed as a solid web, via openwork pattern or motif famous, called "grandma's box". Consider in more detail each of the above embodiments. Vyvyazyvayut chain of three loops and connect the first and last of its loop via polustolbika, so as to obtain a circle. After that is knitted loop for lifting the row and the first and third loop of provyazyvaetsya 1 the pillar without sc, and the second three columns, without sc. In order to at the center had no holes, a chain of three loops need to tighten up a bit for the remainder of the tail started knitting. In the next series of work rolls over and do the lifting loop, then in the following two series of loops is knitted on one without the pillar sc, the next loop, which is the average in the series, provyazyvaetsya again three loops, without sc at this point indicated a diagonal of the square of the future), in the remaining two loops as well as at the beginning of provyazyvaetsya 1 the pillar without sc. 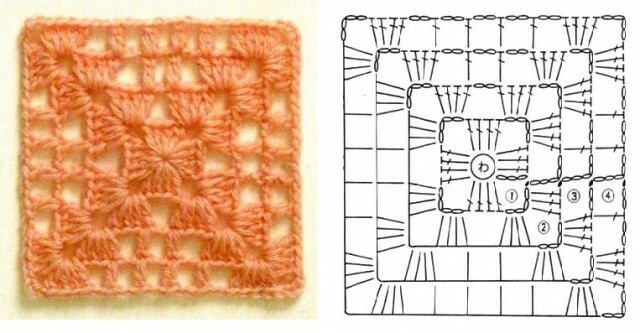 Work turns and then knit crochet square follows the above described algorithm of actions. 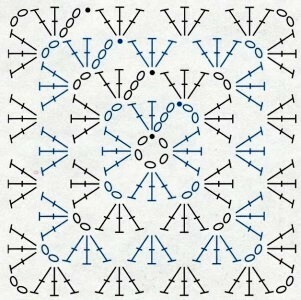 For two rows to each loop provyazyvaetsya by two columns, without sc. Then the number of received loop, and they must come out 12, divided into four. It turns out, three loops on each part. With special fasteners labels, or thread of a different color label the corners of the square of the future, namely the average of each of the loop of the three loops. 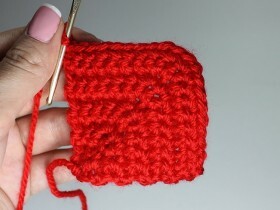 Then, in the next row in the corners provyazyvaetsya three column without sc, and in the rest of the loop a number one and so on until the end of knitting, until the square is the desired size. Very beautiful are obtained, eg, prihvatki, vyvyazannye manner. 1p. At the beginning of a series of three loops do lift plus three loops provyazyvaniya drawing. Then the hook is introduced into the circle of it is knitted and three columns with a single sc, then vyvyazyvayut twice: 3 air hinges, 3 column with sc, and do again three air loop, sc with two columns in the ring and in conclusion a number of the connecting bar into a third lifting loop, linked at the beginning of a series of. 2p. This series begins with the knitting of the connecting column in the first air loop of the first row, We make three air loop, two columns with sc in first rung from the bottom row of stitches, then re-raise three air loops and in the same chain is knitted three columns without sc and do 1 air loop. 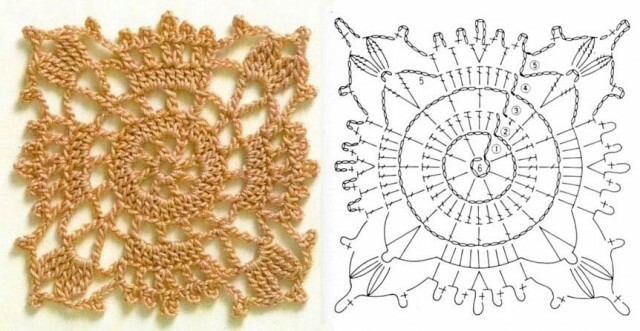 By the same principle of knitting continues until the end of the series. At the end of series, as well as in the front row, We do polustolbik the third lifting loop. 3Number starts again with three lifting loops and no one else to add to the picture. Then in each chain of three loops of the previous row you need to purl: three columns with sc, three air loops and three columns with sc, then do one air loop connects two arcs, and in an arc from one eyelet provyazyvaem three columns, without sc and also to go to raise 1 air loop. The fourth and subsequent rows are knitted similarly to the third row, not to the required size square. 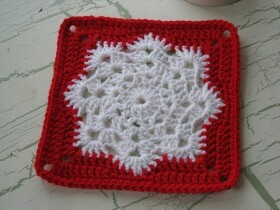 Crocheting grandmother's square can be using the same color thread only, or by using several different, it will be even more original. 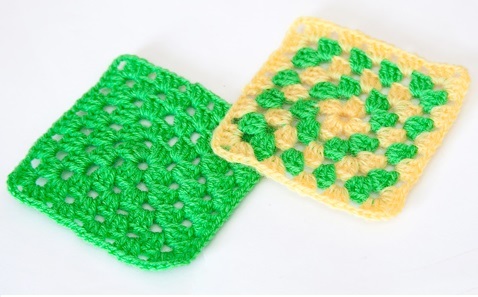 Of openwork squares very well turn out curtains, tablecloths and various little things for summer summer wardrobe woman.